Originating from various regions in the Indian Subcontinent, Cardamom today ranks among the most expensive spices in the world. Prized for its aroma as well as its versatility as a flavoring agent, Cardamom is used in numerous recipes from spicy dishes to desserts and beverages. In addition to its pleasant fragrance and flavor, Cardamom has numerous health benefits ranging from curing dental problems and urinary tract infections to improving blood circulation in the body, alleviating depression and controlling cholesterol as well as cancer to name a few. Cardamom has two main subtypes which are easily distinguishable by their color: Green colored cardamom is the most valued while the other type of cardamom comes in either black, white or red color. Cardamom comes in a pod form which has numerous small black seeds inside it. Both the pod and the seeds are extremely fragrant and flavourful. Considering the numerous health benefits of Cardamom, it is a waste that most people use it just for its aroma and flavor. So, the nutrition experts at the Edison Institute of Nutrition have listed down some of the most important health benefits of the spice which will prove to be immensely beneficial to your health and also save you from running to your local doctor for minor health problems. Along with the above listed major benefits of Cardamom, it has various other uses which add to its versatility. Cardamom has been proven to have aphrodisiac properties and can also help with the treatment of urinary tract diseases like gonorrhea, cystitis etc. Cardamom has also been successfully used as a remedy for hiccups as well as a sore throat. It can be also used as an effective breath freshener because of its strong flavor and aroma. Cardamom is mostly stored as a pod to preserve its aroma and freshness. 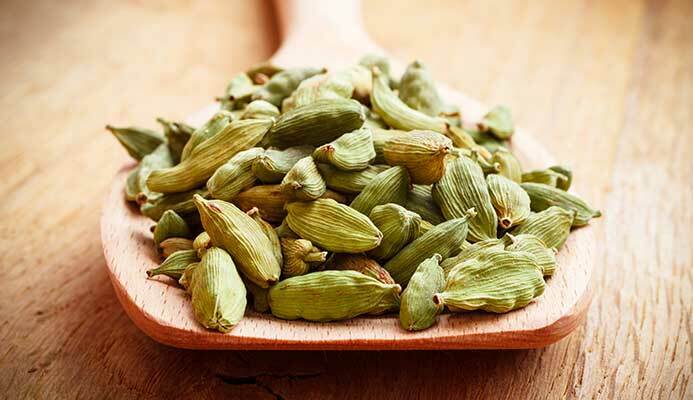 While using in recipes, Cardamom can be used in its pod form while cooking to impart its flavor and aroma. For recipes which call for a more intense flavor, it can be used in a powdered form. Cardamom powder is a popular flavoring agent in desserts as well as beverages. Cardamom powder quickly loses its aroma and flavor due to the quick loss of the essential oils, as a result, it is only recommended to make fresh cardamom powder as per the requirements. Cardamom powder can be made by opening cardamom pods and crushing the seeds found inside using a mortar and pestle. This powder can then be used to flavor a variety of dishes. Cardamom tea is also a very popular beverage known for its sweet and spicy taste. Along with its appealing taste, cardamom tea has numerous health benefits also which has made it a very popular beverage in Eastern cultures since ancient times. 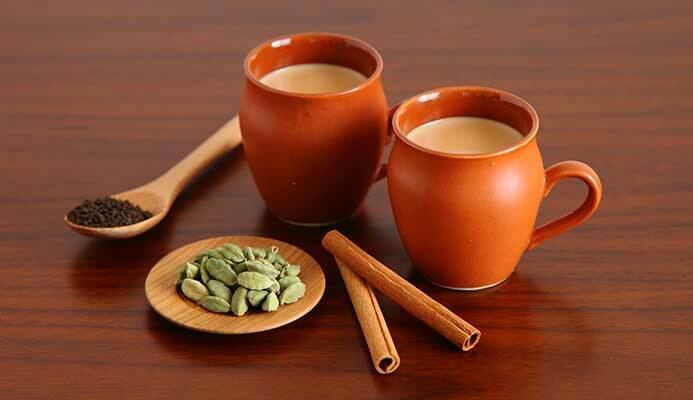 Cardamom tea can also be made in the form of a latte for people who are a fan of drinking their tea with milk. The cardamom pod is opened to extract the seeds, which are then crushed in a powder form and boiled in water to release all the essential oils inside. Cardamom tea has been known to act as a digestive aid and detoxification agent. It also helps alleviate the symptoms of a cold by acting on congested chest and sinuses. WAS VERY GLAD TO FIND OUT THE BENEFITS OF THIS, AFTER READING A BOOK SOME YEARS AGO THAT MENTIONED A CHARACTER IN THIS BOOK DRANK THEIR COFFEE WITH A CARDAMON SEED IN IT. WHEN I FINALLY LOCATED IT I STARTED USING IT AND THE DETOXIFICATION AND HELP WITH MY LABORED BREATHING AFFECT WAS IMMEDIATE. BUT I BELIEVE AS THE X-RAYS HAVE SHOWN IN THE PAST THAT A GROWTH THAT SHOULDN’T BE THERE IS IT WHAT MAKES IT SUCH A LABOR FOR ME TO BREATH IN THE DELICIOUS AIR CARDAMON; HEAVENS FARE.